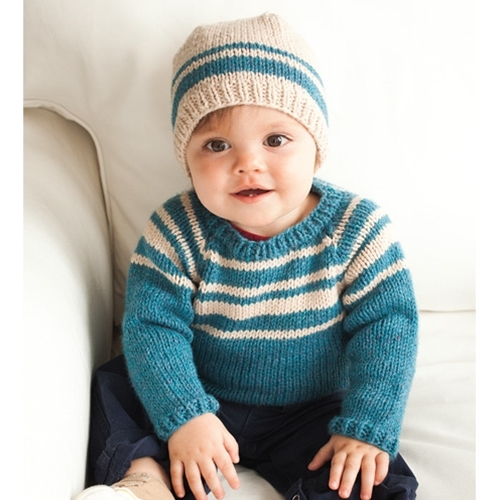 A raglan-sleeve baby sweater, knit in pieces from the bottom up, boasts a staggered stripe pattern that is echoed on the companion hat. For a match mashup, swap the main and contrasting colors of the sweater and the hat. Sized for Baby, Toddler, and Child. Shown in size Baby. 18 sts and 24 rnds to 4"/10cm over St st using size 7 (4.5mm) needles. Sized for 6, 12, 18, 24 months. Shown in size 12 months. 18 sts and 24 rows to 4"/10cm over St st using size 7 (4.5mm) needles.